This is one of the many recipes I have been making over the last two weeks that are straight from the archives of my Aunt Suzy. When I picked this recipe out of a pile of hand written cards I thought it would be super simple. Once I had assembled everything to begin making it I became suspect. Melting chocolate chips without another agent like wax or heavy cream results in a frosting-like texture rather than a runny texture. This doesn’t effect flavor but it makes it much more labor intensive. My apprehension was warranted. When the chocolate was melted down it was to thick to dip the wafers. I had to spread it on each one individually. 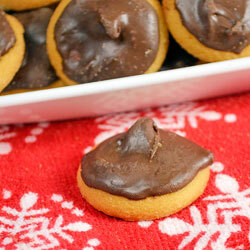 I cursed and swore at the 60-plus little cookies as I topped them. Aunt Suzy would have washed my mouth with soup if she had been there. I didn’t think they were right for Behind the Bites until they cooled and I ate one. They taste just like Girl Scout Thin Mint cookies, and if your not paying attention, you’ll eat them like they were potato chips - it’s worth the work. As I mention in the introduction, I got this recipe from my Aunt Suzy. On the bottom of the card it was written on, it said “TV, Sandra Lee.” This meant that she got it while watching TV and had decided to jot it down. The recipe on the card called for two bags of chocolate chips and a tablespoon of butter and peppermint extract for each bag. I was alarmed right away. A tablespoon of any extract will pretty much blow any other flavor out of the water in a batch of this size. I looked up the original recipe online. The extract amount was a typo from Aunt Suzy, it called for just a teaspoon per bag of chips. It also said to melt the chocolate and pour it over 24 wafers instead of dip them, Aunt Suzy must have felt like pouring the chocolate would have been a waste, and I kind of agree. One bag was enough topping to spread on 60 plus vanilla wafers. 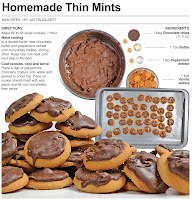 There were challenges for me in making this treat when it came to a nice runny chocolate, but one things is for sure - these do taste just like Thin Mints. If you're a fan, you must try this as a holiday treat. 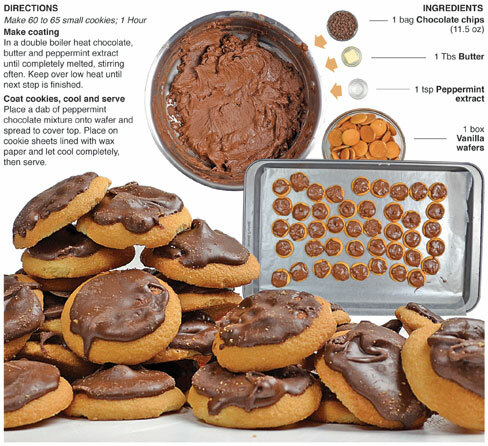 Just be prepared to spread the topping on 60 little cookies. In a double boiler heat chocolate, butter and peppermint extract until completely melted, stirring often. Keep over low heat until next step is finished. 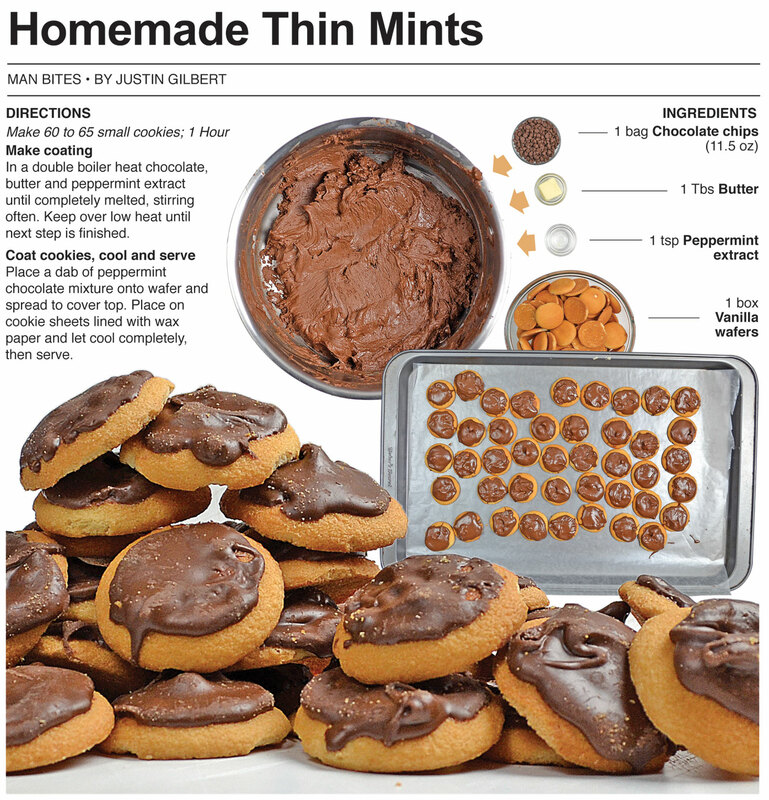 Place a dab of peppermint chocolate mixture onto wafer and spread to cover top. Place on cookie sheets lined with wax paper and let cool completely, then serve.